I just bought an ice cream maker and I’m not afraid to use it! So what should my first flavor be??? 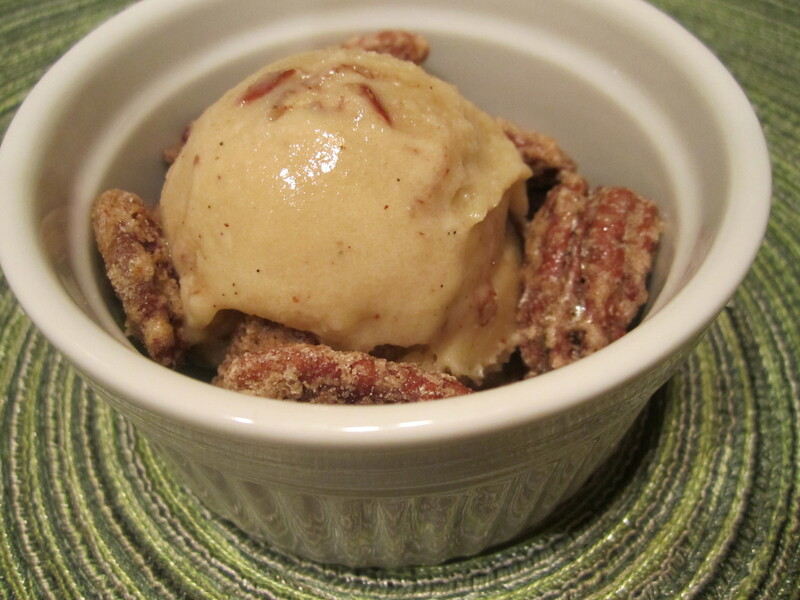 I got a lot of ideas from the mob but nothing looked better than brown sugar ice cream with homemade candied pecans. It’s a flavor I’ve never had before and it just sounds delicious. And to shake things up a little, my version isn’t even dairy! But don’t worry, you won’t even know that the milk and cream are missing. 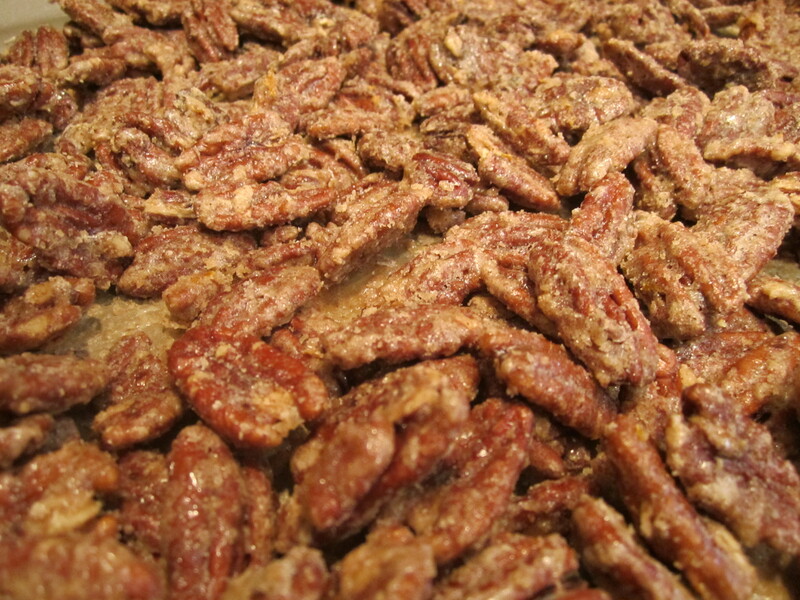 And to make the whole process even better, you will definitely have extra candied pecans to snack on every day. Mmmm…candied pecans. Yum! You’ll see! So we’ll start with the candied pecans, which can be made in advance. 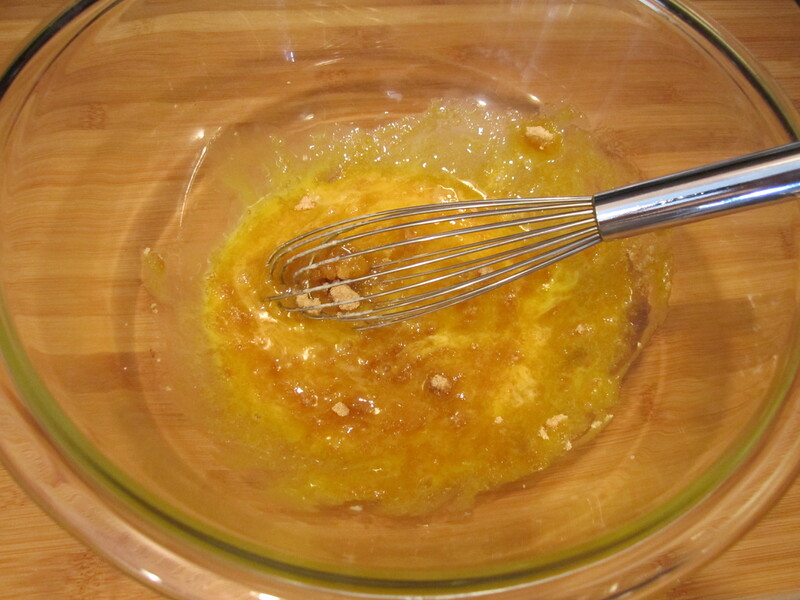 I placed the sugar, salt, cinnamon, nutmeg, pepper, and orange zest in a bowl and stirred to combine. 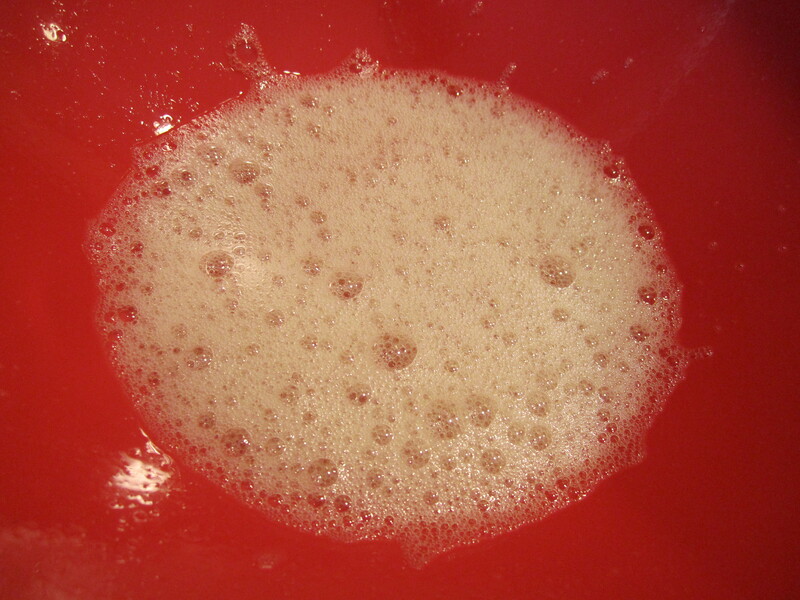 In a large bowl, I combined the egg whites, water and vanilla and beat until foamy. 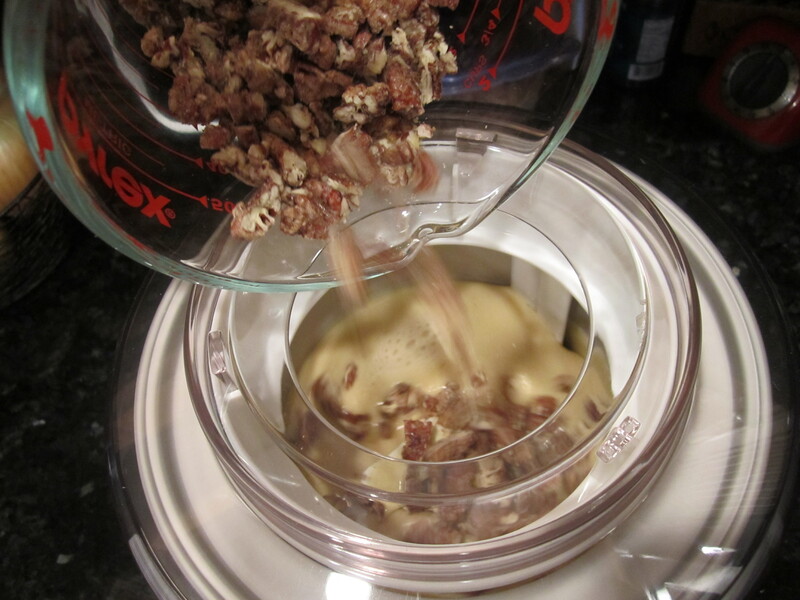 I poured the pecans in the bowl with the egg white mixture and stirred until well coated. 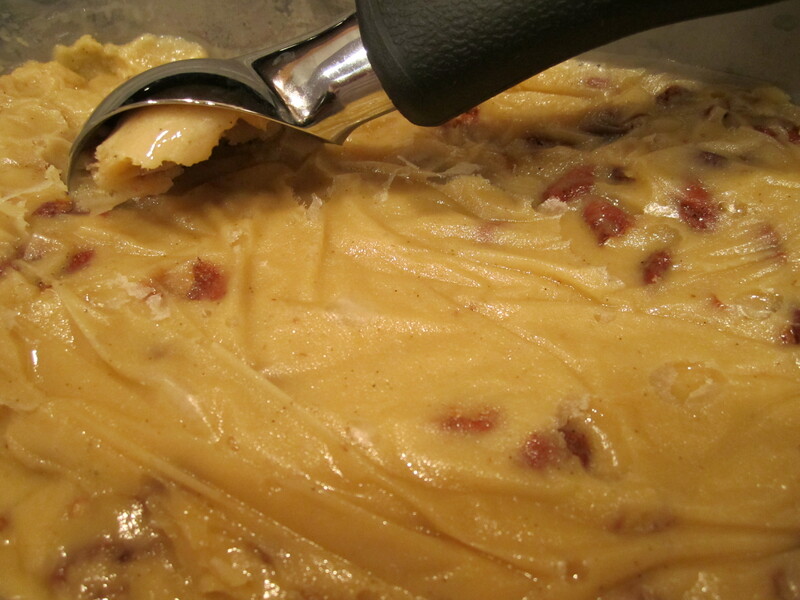 I gradually added the sugar mixture 1/4 cup at a time to the pecans, stirring well after each addition. I poured the pecan mixture on to a prepared rimmed baking sheet. I baked for 1 hour at 250 degrees, stirring the pecans every 15 minutes to prevent from them from burning and sticking to the sheet. 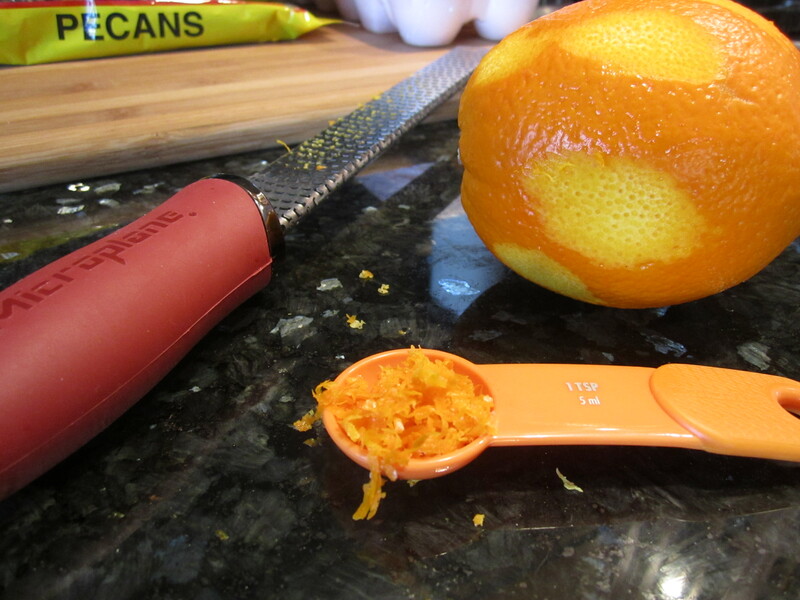 My house smelled incredible from the orange zest and the spices! 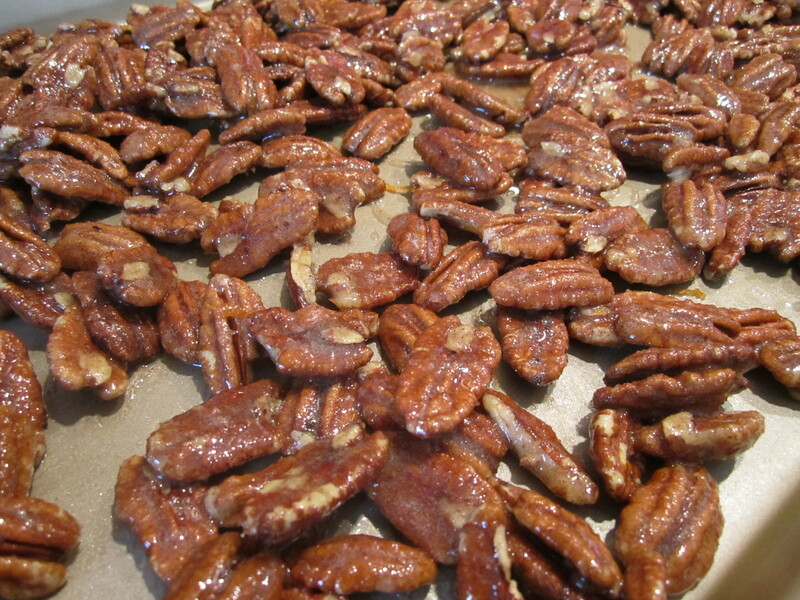 I can’t wait for you to make these pecans so your house can smell as good as mine! 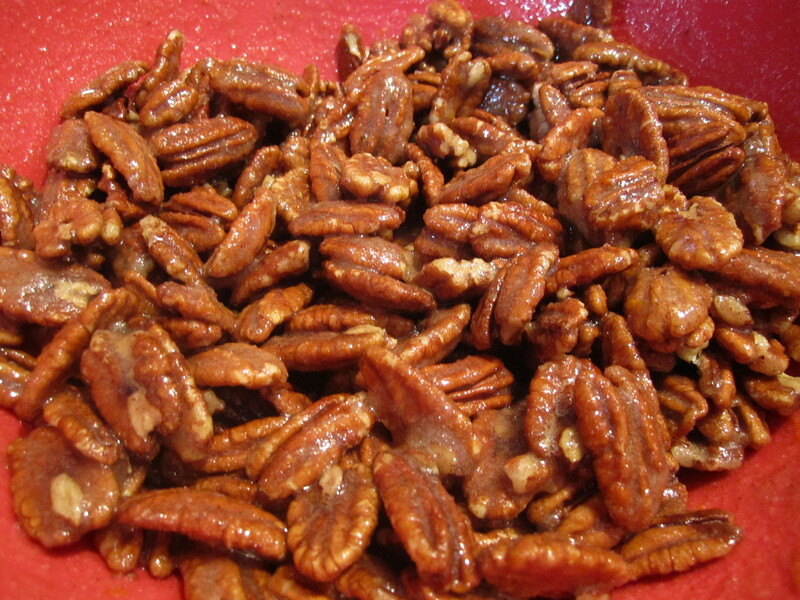 Once they were done, I stored the candied pecans in an air tight container. You can also freeze them for later use. Now on to the incredible brown sugar ice cream! I combined the whipped topping, soy milk, and 1/2 cup brown sugar in a large saucepan. I scraped in the seeds of the vanilla bean then added the bean. 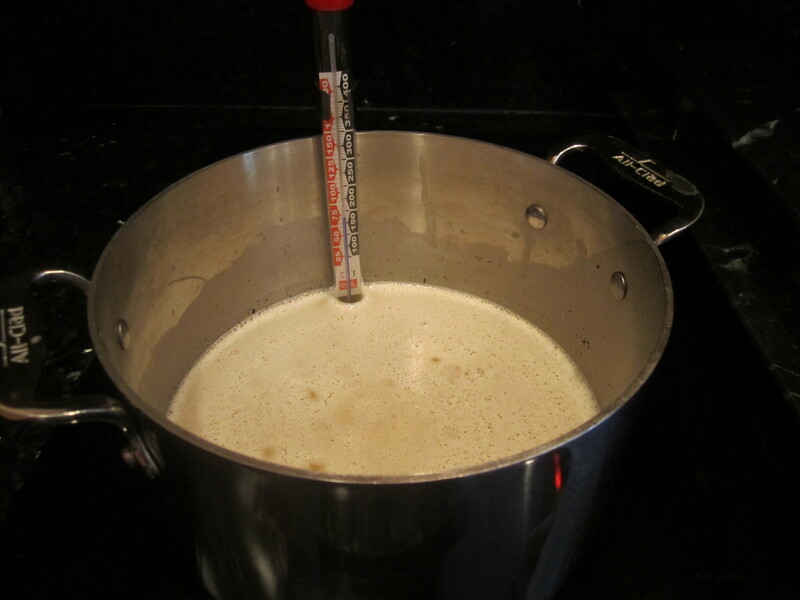 I brought the mixture to a simmer over medium heat, stirring until the sugar dissolved. Separately, I whisked together the yolks and remaining 1/4 cup brown sugar in a large bowl until very thick, for around 2 minutes. 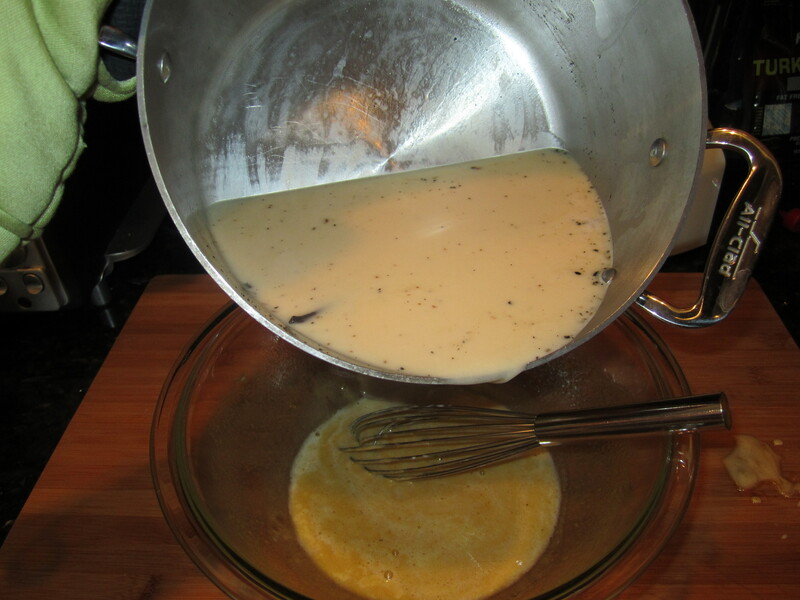 I gradually whisked the hot cream mixture in to the egg mixture and returned to the saucepan. 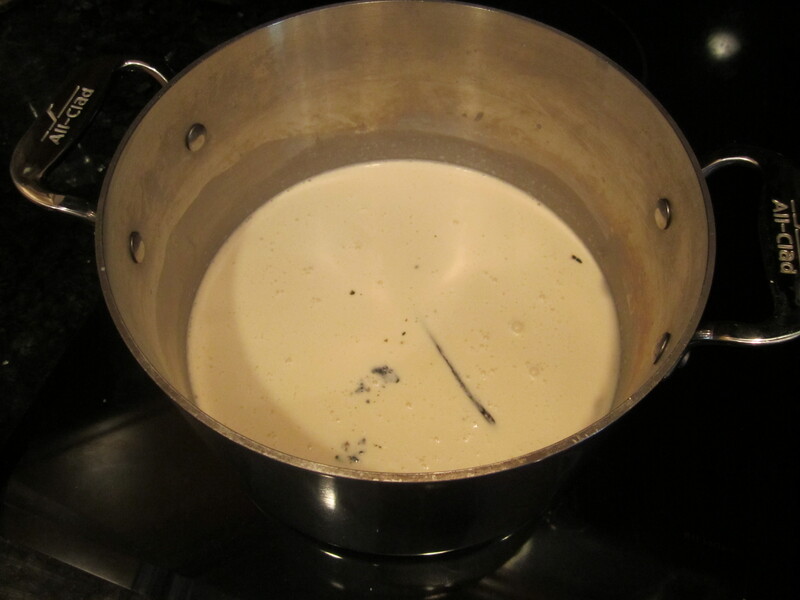 I added a thermometer to the saucepan and stirred the mixture over medium heat until the custard thickened and the thermometer read 180 degrees F. It took around 5 minutes. Just make sure not to boil the mixture. 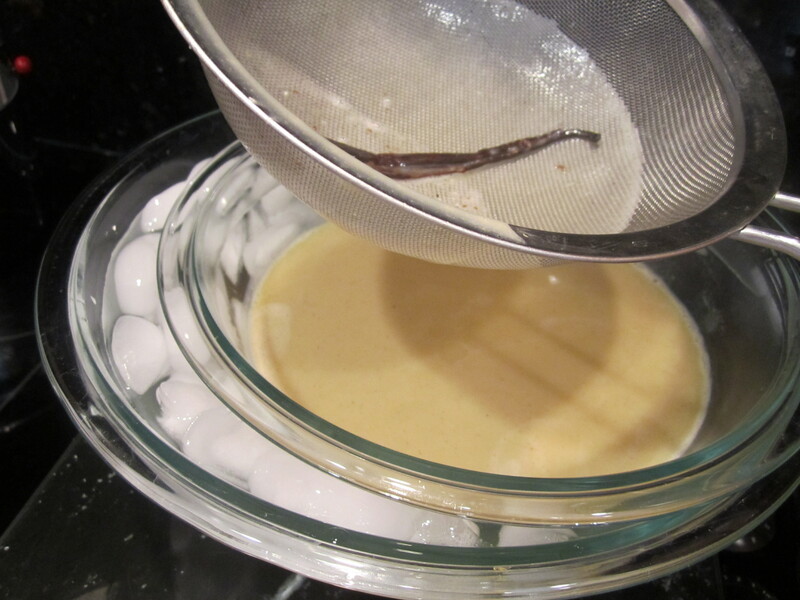 I strained the custard in to a large bowl set over another bowl of ice and water. 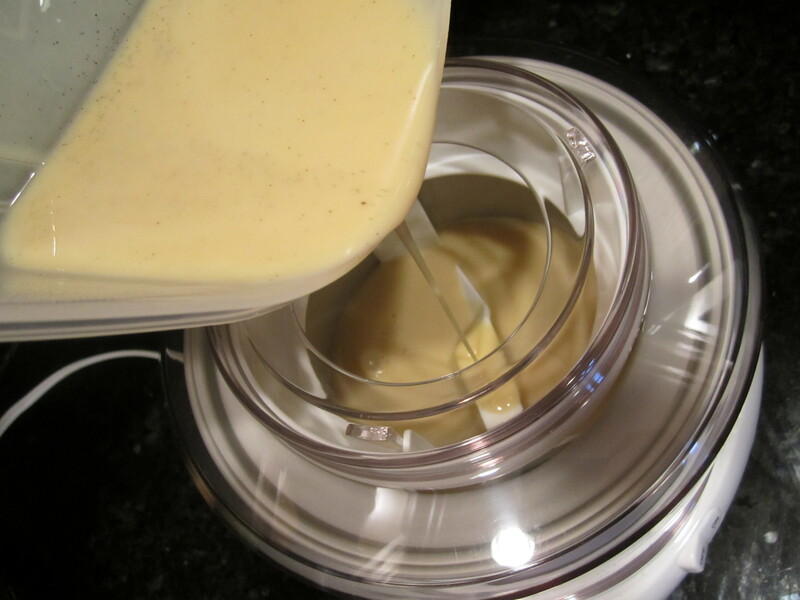 I cooled the custard completely, stirring often, for 15 minutes. I covered and chilled for at least 2 hours. I suggest chilling overnight if you have time. I poured the custard in to my new ice cream maker and froze it according to the manufacturers directions. Basically, I turned on the machine so the frozen bowl was spinning then I poured in the ice cream base. While I was waiting, I chopped up 3/4 cup of the candied pecans. 15 minutes later, when the ice cream was near completion, I added the pecans and continued churning for another 5 minutes. I packed the ice cream in to a plastic container and pressed a sheet of plastic wrap directly on the surface to prevent ice crystals. I closed the container with an airtight lid and froze until firm, at least 4 hours. And then the ice cream was ready! I definitely suggest adding extra candied pecans over the top for more crunch factor. And if you’re a diabetic like me, don’t forget to take your insulin! Enjoy. This is one that got your Uncle John all excited, so I promised to make it for him. But not today! 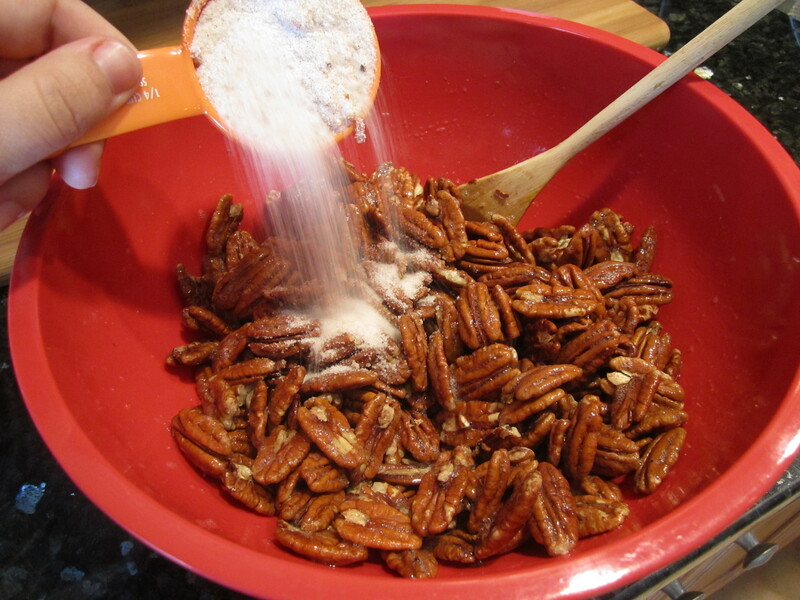 But today I am going to make your candied pecans (but with Splenda) because my recipe only has the cinnamon, and the other stuff sounds like an even better and more interesting version. Thanks so much for teaching this old dog some new tricks! oops. it doesn’t say what temp to bake them at–350? Sorry! Added it to the post. 250 degrees. So the candied pecans on their own are fabulous (but I subbed Splenda). What a treat. Will report in when I finally get around to making the ice cream. This is my kind of ice cream! Yum! Can’t wait to try this! Maybe for next Shabbos!